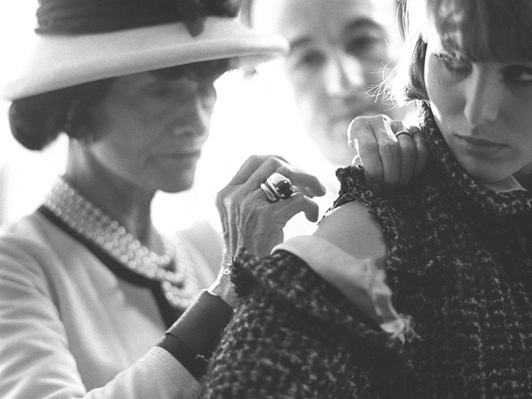 French couturière Coco Chanel pinning a sleeve in 1962. "The opposite of luxury is not poverty because in the houses of the poor you can smell a good pot au feu. The opposite is not simplicity for there is beauty in the corn-stall and barn, often great simplicity in luxury, but there is nothing in vulgarity, its complete opposite." So Gabrielle "Coco" Chanel (1883—1971) told photographer Cecil Beaton in 1966. Raised-panel doors painted with bird portraits in the early 20th century by Danish artist Michael Ancher. Image by Andreas von Einsiedel for "The World of Interiors". [In 2008] a friend on the staff of The Menil Collection museum invited me on a private tour of the meticulously restored residence built by art collectors Dominique and John de Menil in Houston's posh River Oaks neighborhood. I was suitably awed by the anonymous, low-slung, brick-and-glass building (it was designed by Philip Johnson and completed in 1951) and the voluptuous upholstered furniture (custom-made by Mrs de Menil's couturière, Charles James). But as always, I found myself distracted by chic, inventive details. It's the visual equivalent of perusing a book's footnotes before actually delving into the narrative. The treatment of the doors to the small bedrooms, for instance, was more memorable to me than the world-class art on the house's stark walls—their plain front surfaces are clad in the precise shade of crushed raspberries, now beautifully faded. And that unexpected touch of brothel elegance inside that modernist masterpiece (surely the velvet had to be Charles James's idea) got me wondering: Why aren't interior doors more special? 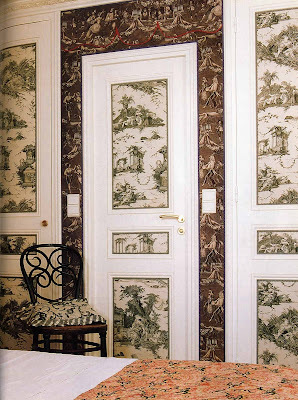 For Christian Lacroix's haute-couture-jewellery director Monica Soczynska, interior designer Gerald Schmorl covered closet doors with mismatched panels of toile de Jouy edged with a complementary gimp. Image by Guillaume de Laubier for "The World of Interiors". What could be simpler than upgrading a door, so many of which are distressingly banal? They certainly could be wrapped with, say, Italian marbleized book paper. Why not cover a door in burlap held fast by large brass nailheads or perhaps in alligator-textured artificial leather or sumptuous suede, whether real or mock? I have considered decoupaging a dull door with overlapping paper cut-outs in emulation of the influential work of designer John Derian or a Victorian scrap screen, protected by a coating of clear shellac. 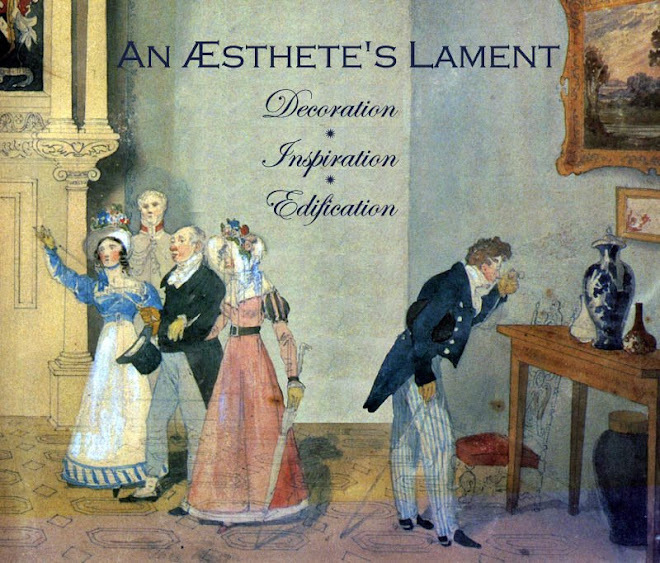 A door could be given a striking new countenance through the studied application of stencilled decorations or intricately joined bits of fabric echoing an antique crazy quilt or an icy span of palest blue silk moiré edged with silvery galloon. One could also break out various shades of paint and speckle a door's surface like spatterware or a dappled Early American floor. 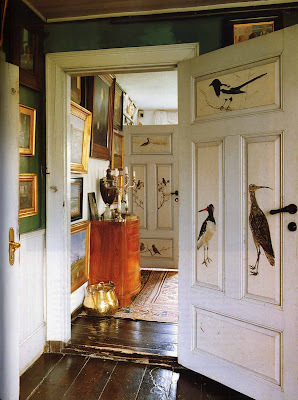 And if the door in question is a traditional model divided into symmetrical panels, use those individual sections as canvases in the manner of Swedish artist Carl Larsson and his wife, Karin. In the late nineteenth century Larsson improved one such door in the couple's impossibly charming house, Little Hyttnäs, with a painted depiction of a tall, lushly blooming amaryllis that spanned two panels, its attenuated green stalk interrupted by the door's white framework. 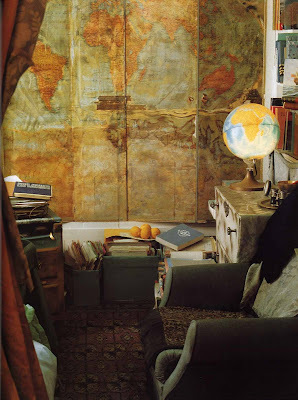 In the Paris bedroom of oceanographer Anita Conti, the folding doors of her built-in wardrobe are layered with shellacked maps of the world. Image by Guy Hervais for "The World of Interiors".